Mouse Extermination – 1hr Response! Mice Extermination Covering all London & surrounding areas including, the West, Harrow & Kingston, the East, Romford & Ilford, The South, Croydon & Bromley, the North, St Albans, Hatfield, Barnet, Watford & Redbridge, Essex, North Sussex, Surrey, Slough, Reading and the Home counties including Luton, Bedfordshire, Kent, Chelmsford, Oxfordshire, Milton Keynes, Newbury etc. JG Environmental (Pest Control) a professional family run pest control company based in the London area take pride in suiting your needs. We develop our service constantly to provide the whole package. We provide proofing, baiting, trapping and more. All from a willing friendly technician. EMERGENCY SERVICE AVAILABLE – Please call now if you require emergency control. We are able to deal with your mice extermination problem using several methods from trapping to poisoning we also use humane options. Proofing- JG Environmental provide specialist proofing for rodent and bird pests, from small proofing applications using fillers, wires or mesh to full attic/ loft space proofing, for proofing quotations please email or call using the contact information at the top of this page. Mice are one of the most common pests we deal with. They are known as a hygiene and health issue because of possible diseases they can carry. JG Environmental use different techniques to exterminate and remove your mice problems including- professional poisons, snap traps, live catch/ sticky traps, contact powders and more. All services guaranteed! Some information about the common mouse! If you have a mouse problem or a problem with mice, before a successful treatment can be carried out a proper survey needs to take place, initially our technician will look round your property to identify 1, where the rodents activity areas are, and 2, where they are getting in. It is good to tell the technician any information possible with regards to the entrance points and areas you have seen droppings or the rodents. Although mice may seem tiny, in relative terms, mice have big areas and big protruding eyes. The most common mice pest control involves usually one of 2 mice species, these are the wood (or field mouse) and the more common house mice. The field mouse is around 2 inches long (without the tail) and is fair brown in colour. The common house mouse with smaller ears is a little smaller in overall size and darker colouring often described as grey. The difference between a mouse and a rat is seen eaily by their feet size. Rats feet are much larger relative to the body size. And of course, when adult, rats are far bigger than mice! Being nocturnal (sleep in the day and awake at night), you will often not see mice, its far more likely you will find signs of the mice being there. It is fairly obvious when you have a mouse problem. The most commonly reported sign is the droppings, mice will leave a trail of droppings everywhere they occupy it is also not a surprise to see evidence of damage to boxes, wires and foodstuffs if you have mice living in your home! Of course damage to wiring can lead to far more serious problems in the form of house fires. Just because you haven’t noticed any of these visual signs does not rule out mice living in your property. We are often called out because of the horrendous tapping/ scratching sounds the mice make when they live in cavities. Mice may have no access to your living areas but still live in your walls. 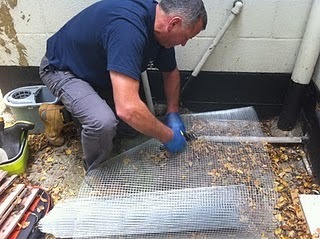 Usually they will have got in through an external hole that leads into the cavity, this shelter is idea for a mice nest. Being extensively trained and with years of experience it will not take long for our technician to find the mice hot spots. He will usually then bait and block up entrance holes in effort to eradicate the problem as soon as possible! A rodent treatment can take up to 3 weeks to be fully effective, however if we are able to identify the high activity areas early on results may be seen much quicker than this. If we see a mouse whilst we are there there is a good chance using specialist traps we can remove it there and then reducing the problem immediately! Mice pest control covering all London and surrounding boroughs.